With millions of blogs, and millions of blog readers exchanging information across the world wide web, what are enhancements that can turn the ordinary into extraordinary with respects to blog appeal? Here are a few suggestions for building a blog that offers greater functionality while also standing out from the ordinary. This post will focus on features provided by Blogger. However, excellent platforms such as WordPress, EduBlogs, and Weebly offer similar enhancements for educators and their students to create attractive, engaging blogs. Why? - Increase the chances that your blog will be appreciated by world-wide audience. Google Translate will convert your words into other languages. How? - Google Translate can be found in the Blogger gadgets menu. Click on "Add A Gadget"
Blogger has about thirty "gadgets" built into their main menu. 900 others may be found through their web menu. You can also create your own gadget by searching the Internet for the HTML code, then copy / paste this code into the HTML/Java Script gadget. Why? - Readers are liking what you have written and want to share it out to other people in other locations on social media. How? - By default, Blogger provides a menu of "share to" buttons that are included in the post window. However, accentuated "share to" buttons can be found in the gadget menu. Why? - Let readers know what is permissible with respects to your intellectual property. Provide notice of legal protection against commercial exploitation. How? - Blogger has an on board attribution gadget, but I prefer the Creative Commons license that can be customized and added to the blog tool bar. Use the radial buttons to choose the license that fits the needs of your site or blog. Why? - Media such as photos and videos add visual appeal and help reinforce the message of the post. Not all images on the Internet are free to use. Images that are not created personally must be free to use and share, and / or modify. How? 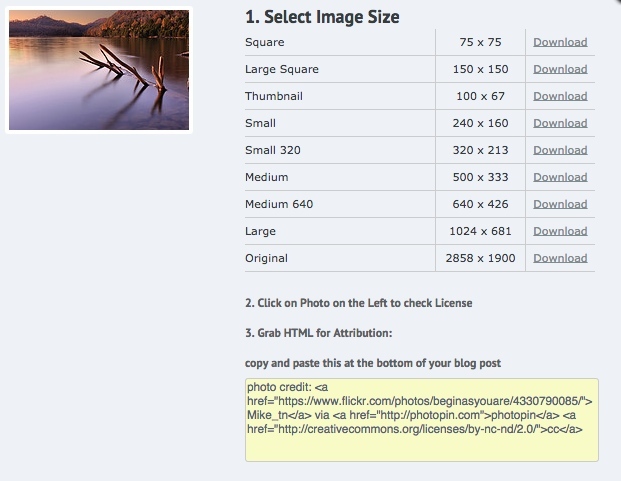 - Use your own images whenever possible. Otherwise, I like sites like Photopin which provide commercial and non-commercial images from Flickr along with the HTML code for attribution so credit can be given to the provider. Insert the image at the desired location on the page. Copy the attribution code and paste into the HTML editor for the page as either a credit or as the image caption. With good reason, more educators and their students are sharing their learning with blogs. There are many helpful tools available to make blogs more interesting and interactive. Knowledge and use of these tools can help turn an ordinary blog into something uniquely engaging. Are you a blogger? What features make your blog interesting and unique?